When the Green Wind turns up at Septembers kitchen window offering her an adventure she doesn’t think twice, hops on the back of The Leopard of Little Breezes and flies away to Fairyland. She doesn’t wave goodbye to the factory where her Mother works or give her Father a second thought when they fly over Europe where he is fighting in the war. September is expecting fun and laughter but Fairyland is in crisis and confusions, the villainous Marquess is ruling the kingdom with an iron fist and September has to find the key to stop her awful rule. Off she goes with her new friend A-through-L, a Wyvern, and a blue boy named Saturday to fight the fears and save Fairyland, but can she do it in time and stop her friends from getting hurt? When I saw the cover and name of this book it was instantly on my wishlist. It sounded brilliant and crazy and something that we haven’t had in a very long time. When I started watching it I was giggling within the first chapter and I knew I was going to love it. The story is surreal, once September finds her way to Fairyland she comes across witch sister who are married to the same wairwulf and her friend A-through-L (Ell) who believe he is part Wyvern and part Library. The witches, Hello and Goodbye, and their husband Manythanks tell September about the Marquess and how she stole Goodbyes spoon when Goodbye refused to tell her how she would die. September sets off on a quest to rescues Goodbyes Spoon and that’s where the adventures really start. I loved Septembers travels across Fairyland and all the characters she met, I liked how everything links in, from her losing her shoe right at the beginning of the book to her getting new ones later and wanting rid of those. The whole world was really well put together and I was really impressed with the world building. I liked the rules and regulations around Fairyland and how strange and random they seemed. September was an amusing character to follow and I think thats because the book was told in a third person perspective with the narrator even cutting out to speak to the reader sometimes. Because of this September appeared to be a loving, caring little girl with a big heart but perhaps one in the wrong places. She was a great 12 year old with the attitude of one from many years ago. I have a feeling that the book was set in one of the World Wars, possibly the second, but my history isn’t great, and because of that September isn’t a typical girl from modern times but you still feel a connection to her. Ell was an amazing companion for September and I loved his personality, he was so excited about things but also very shy and second-thought-ish. When Saturday is added to the group I was a bit unsure about him but I soon grew to love him. Saturday was a lovely character and he was very unsure of himself. I think my favourite characters were the Farthings and I loved the way they rode the wild bicycles. The book reminded me a lot of Alice in Wonderland and The Wizard of Oz, its a similar kind of story and done in a similar way, The Girl Who is definitely modern classic material and I will be keeping my copy to read to my sons and daughters in the future. This is a bit of a good thing and a bad thing because I couldn’t help comparing it to the classics it reminded me of but I think it was still very original and I think it stands alone from the classics well. Each of the chapters were headed with an illustration and this really added to the story because I took a couple of minutes to look at them and then keep them in mind for the chapter and how the images fit in to the story. I really did love The Girl Who Circumnavigated and I would recommend it to many people. It is made from classic material and its very surreal so you have to give it a bit of imagination but if you have enough its well worth a read and I loved how it ended and I didn’t see a lot of it coming. The one thing thats not great with the book is with it is a bit difficult to read, its written in a strange style that we don’t get a lot of in modern day books but its still well-written, you just have to give it a little more time than you usually would give a book, its a difficult book to skim over. It has been quite hard for me to write a review on this book because I really did love it more than words can say. I really do think its one you have to read and gather your own opinion on it because it probably won’t be for everyone but it was definitely for me! 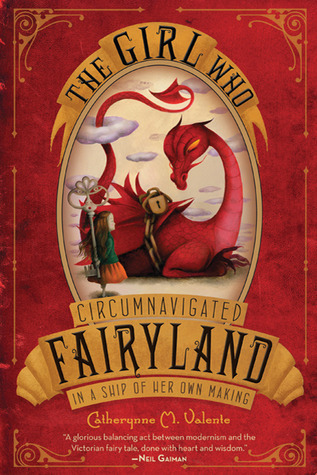 The Girl Who Circumnavigated Fairyland in a Ship of her own Making was released on June 7th by Corsair. My copy was received in exchange for an honest review from the publisher. I’m dying to read this – it sounds incredible. Great review! I’ve heard so much about this…Fantasy books with this amount of epicness are hard to come by-I’ll definitely have to read this some time soon!